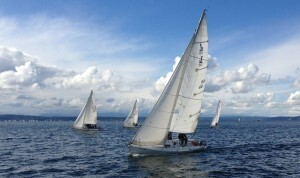 The Unlimited Day Sailing Memberships are the heart of the Seattle Sailing Club membership program. The philosophy behind them is simple – give sailors an easy and affordable way to sail a lot! It’s a truly unique membership opportunity to have unlimited access to so many varied and high-quality boats, and to be sailing on the safe, exciting, and gorgeous waters of Puget Sound, at a fraction of the cost of ownership. When you’re ready to join the club, you can either sign up over of the phone or stop by our office. We’ll set up your 12-month contract, settle up on the one-time membership set-up fee, give you a tour of the club, dock, and boats, and introduce you to our friendly Seattle Sailing Club Crew! Once you’ve become certified(ASA103 or higher) or passed your SSC checkout, you are now ready to reserve a boat! There are 2 ways to reserve a boat: by Phone (206)782-5100 or Email. Whichever is easier for you, works for us! When reserving a boat, please provide us with your name, club level, requested boat’s name, the day of pickup, and times you expect to pick up and bring back the boat.